The Batch Module is an implementation of the Spring Batch, which is a framework for dealing with batch processing - reading and processing large amounts of data. Batch Module essential functions are scheduling, triggering and processing the jobs. It allows to schedule and automate basic batch operations so they can be executed without any user interaction. In response you should receive HTTP success (2xx) code with response body being string informing about number of jobs. 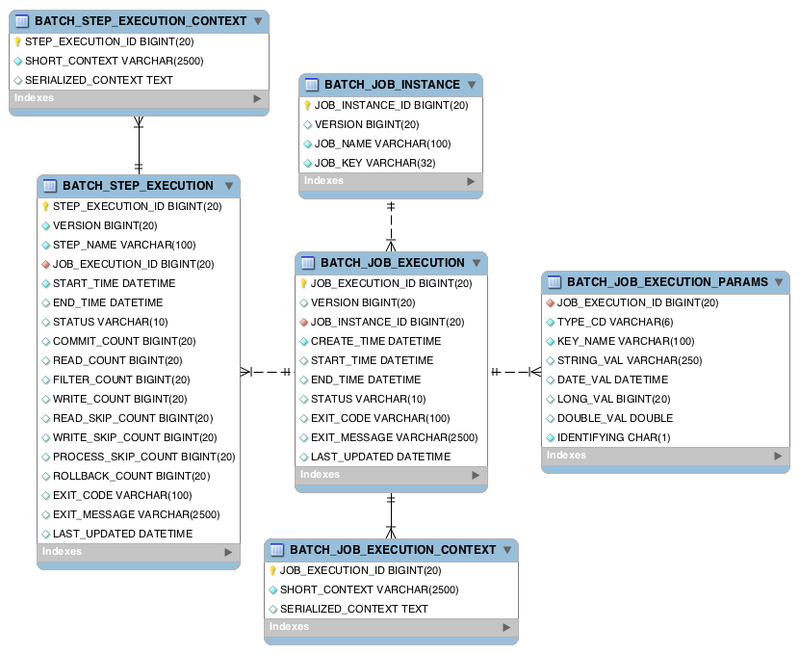 Batchlet interface defines two methods to override - process() and stop(). The process() is called everytime the job step is executed. The stop() is invoked by the Batch runtime as part of JobOperator.stop() method processing. This simple example will print “Processing Batchlet” string on standard output each time the logAnalysis runs. You can find the description of REST endpoints and services API below. jobId long Id of the job. jobName String Name of the job. cronExpression String Cron expression used for scheduling this job. status String Status of the job. The job can have ACTIVE or INACTIVE status. parameters Map<String, String> Map of parameters with which job is executed (if any). createTime DateTime Time of the job creation. lastUpdated DateTime Time of the last job update. createdBy String Author of the job. lastUpdatedBy String Author of the last job update. Only scheduled jobs will be returned. If job was defined but not scheduled, it won’t be on the list. where jobName is the name of the job for which history should be retrieved. startTime Date Time at which job execution started. endTime Date Time at which job execution ended. createTime Date Time at which job execution was created. exitStatus String Status with which execution has ended. jobParameters Properties Parameters of the job for this execution. batchStatus BatchStatus Batch status of this execution. It’s one of the possible statuses: ABANDONED, COMPLETED, FAILED, STARTED, STARTING, STOPPED, STOPPING. executionId long Id of this execution. lastUpdatedTime Date Time at which job execution was last updated. where jobName is the name of the job which should be executed. If job requires parameters to run, parameters from the database will be used. jobName String The name of the job to schedule. cronExpression String Cron expression which will be used to schedule the job. paramsMap Map<String, String> Map of parameters needed by the job to execute. where jobName is the name of the job which should be rescheduled and cronExpression is a new cron expression for this job. where jobName is the name of the job which should be unscheduled. date String Particular date to run the job. Passed in dd/MM/yyyy HH:mm:ss format. where jobName is the name of the job which should be updated and paramsMap is a map of new parameters for this job. The parameters map sent in request is compared with existing parameters for the job. If for any parameter the key exist then its value is updated, else new parameter is added for that job. where jobName is the name of the job and executionId is the ID of the execution to restart. Errors that occur when using Batch module are wrapped in a custom BatchException exception class. This class contains reason field that contains description of what caused failure and batchErrors field, which contains BatchErrors object. BatchErrors object contains more detailed information about error, which are message, code and httpStatus. Please refer to table shown below for detailed description of these fields. message String Short message describing an error. code int Custom error code for this error. For possible error codes and meaning of them please refer to the next table. httpStatus HttpStatus Http status associated with an error. Batch module defines custom error codes, you can find description of them in the table below. 1001 400 Bad Request One or more input parameter(s) may be wrong. 1002 400 Bad Request Job not found. 1003 400 Bad Request Duplicate Job. 3001 500 Internal server error Error in starting job. 3002 500 Internal server error Error while reading from or writing to the file. 3003 500 Internal server error Error in querying database. 3004 500 Internal server error Error in unscheduling job.